Northshire Bookstore in Saratoga Springs, NY is a book lover’s dream. The entire upper floor is devoted to children’s books, and the incredible staff is devoted to children and their parents. Events for kids—planned with excellence by the ever lovely and hospitable Rachel Person—are always happening at Northshire. Because my family lives nearby, I am considered local artist. 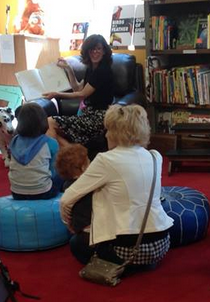 Northshire has been extremely gracious, inviting me to participate in some very cool kid-friendly events celebrating independent bookstores, and also events designed to promote specific books I have written and/or illustrated for duopress. One little guy and his amazing mom have tied all of these experiences together for me in a manner that can only be described as uncanny. At the time I was in the middle of a new illustration project, Brooklyn Baby. While drawing characters for the busy farmer’s market scene shown here, the little red-headed baby and his mom from Northshire came to mind. I put them at the pickle stand. Purple hair didn’t seem inappropriate for Mom, and I am Violet after all—so I painted her with purple hair. This image is one of my all-time faves, in large part because of these two characters. 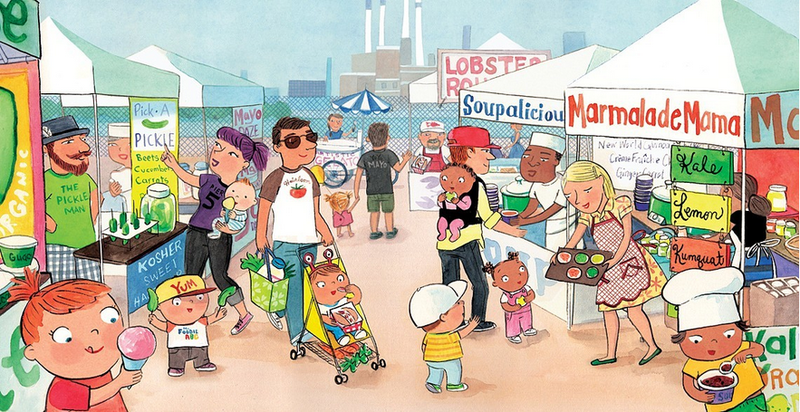 Written by Lisa McKeon for duopress, Brooklyn Baby was released in the fall of 2014. Fast forward to May 2, 2015. 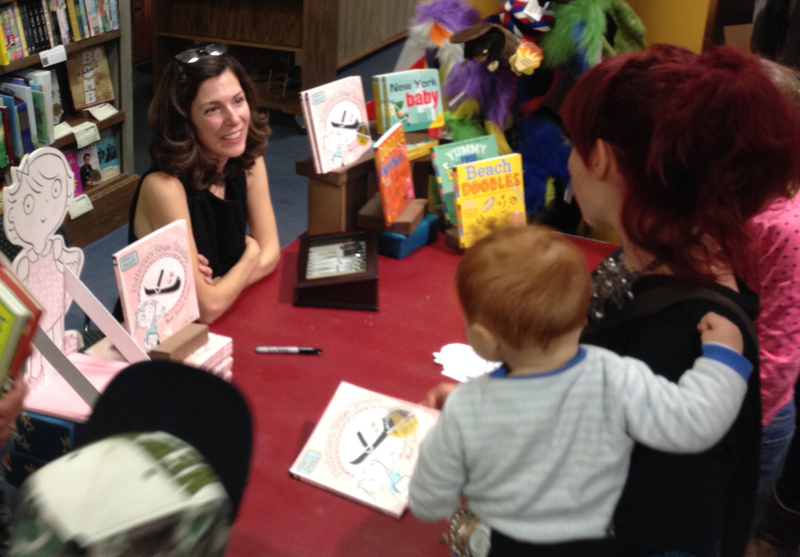 Northshire invited me to read from my favorite Dr. Seuss books at an in-store event celebrating independent bookstores. While reading aloud from Oh, The Places You’ll Go, I noticed a red-headed toddler in the crowd, sitting with his very stylish blonde grandmother. Later, these two were joined by the toddler’s mother—whose hair was a glorious shade of violet—and who was carrying a new baby. I recognized the family and approached them while frantically scrolling through Facebook photos on my phone, searching for the farmer’s market scene from Brooklyn Baby. The mom and I peered at the image together on the tiny screen, both of us amazed at the connection between us. In my mind, this was the penultimate Sisterhood Moment—two artistic women, strangers connected by motherhood, a love of children’s books, and hair color. As they disappeared into the stacks on the other side of the store, I instantly regretted not having exchanged contact information. Yesterday (June 13, 2015) Northshire hosted an event for my latest duopress illustration project, 100 PABLO PICASSOS (written by Mauricio Velázquez de León). My family is moving to New Zealand at the end of June, so this event was especially poignant for me as I knew it would be my last one in Saratoga Springs. 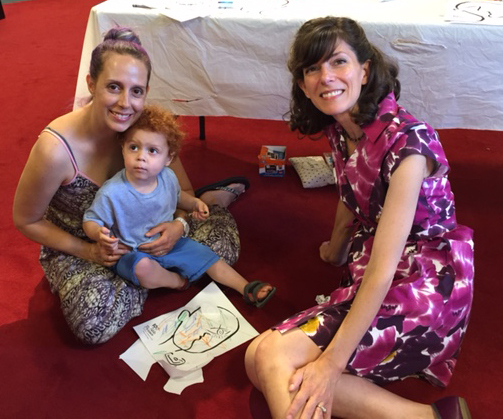 Families filtered in as we kicked off the event with a game of Picasso bingo. I was delighted when my eye caught glimpses of red and lavender hair in the small crowd. They had come! This time we had a change to chat for a few minutes, and I made sure to jot down names—and get permission to share this story! 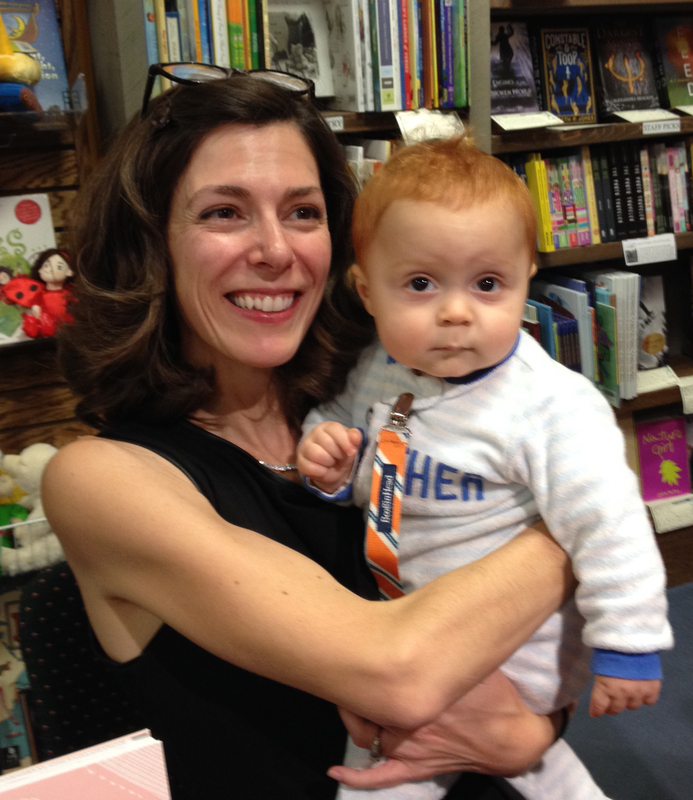 Class, meet Michele Sperber, the mystery-mom (whose violet hair is now a softer shade of lavender) and her little red-head Landon—who is now a big brother! This photo was taken by Marilyn, Michele’s beautiful, charming mother-in-law. My only regret at this point is that I didn’t get a photo with Marilyn! Soon I’ll write a post about all of the events we’ve done to promote 100 PABLO PICASSOS. Several incredible local shops have hosted events for me, and the best part about that has been the people; in particular, the hostesses who made it all happen. But for today I wanted to share this odd little story, because stuff like this makes life interesting and beautiful. What a gift. 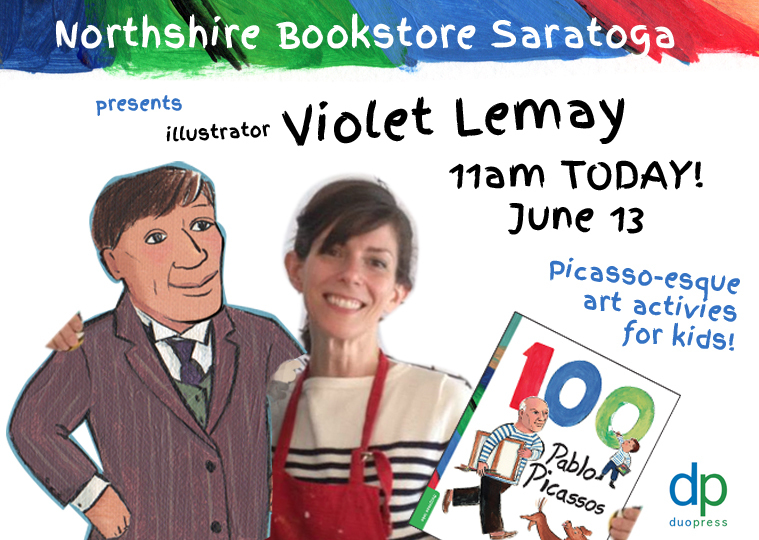 100 PABLO PICASSOS (written by Mauricio Velázquez de León/illustrated by Violet Lemay) is available Northshire Bookstore Saratoga, and at bookstores everywhere. Click here to order your copy today! This is an awesome story! Thanks for sharing it!